Coach Cam Shepherd addressing the players at Leederville Oval. 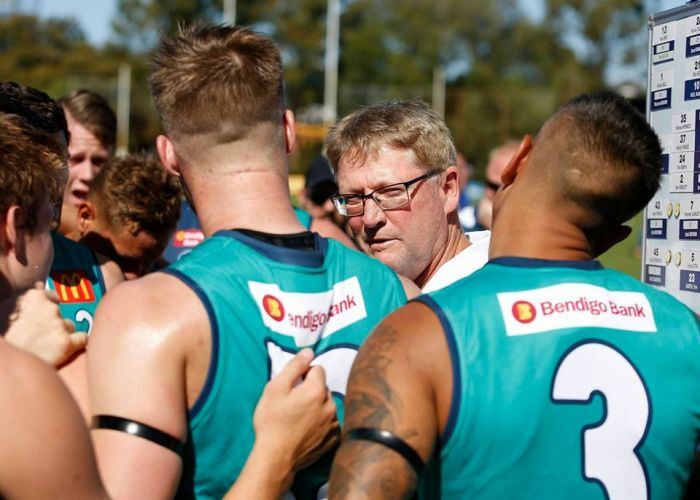 PEEL Thunder suffered its third loss of the season at the hands of East Perth by 66 points at Leederville Oval on Sunday. The Thunder trailed the Royals at every break as East Perth cruised to a 21.8 (134) to 10.8 (68) finish. Peel Debutant Kalani Scarrott said the intensity coming from reserves to league was very different. “It’s definitely a step up and it’s a bit more intense but we have a good bunch of lads… they were really helpful so it was good,” he said. Peel Thunder hit an early lead in the first quarter, although they struggled with their goal accuracy. The Thunder’s inaccuracy continued in the second quarter as they failed to kick a major for the first 14 minutes. Scarrott said coach Cam Shepard had a lot to say in the half time break about their intensity around the ball. “Shep just wanted us to lift more constantly and keep going throughout; I think the start of the third we sort of hit it but we just trailed off. It’ something we can work on for next week,” he said. Peel Thunder was able to stay with East Perth in the third quarter, hitting the scoreboard with five goals to go into the final break trailing by 36 points. However, the Thunder failed to stay with the Royals in the final term only managing a single goal to East Perth’s six. Leroy Jetta was one of the few standouts, racking up 11 disposals, three marks and kicking two majors. “It was exciting to have someone like Jetta in the team, pushing up forward for them,” Scarrott said. “I love having Jetts up forward, he has a good presence; basically we just need to get it in quicker to him and he will do the rest for us”. Peel Thunder takes on Claremont Tigers at Bendigo Bank Stadium next Saturday, May 5.